The program will include new, original Yiddish and Hebrew songs by Lenka, as well as more traditional selections. Participants will also learn two new songs (song sheets provided). Admission is free and the company is delightful. You can meet lots of lovely people there of all nationalities and types so come along and enjoy dancing and stomping into the early hours. NEW KLEZMER MUSIC and IT ROCK’S !!! Kabbalah déboule comme une comète dans le paysage musical actuel et crée à l’évidence un son nouveau. Au melting pot de la cité phocéenne, antique carrefour des langues et des cultures, Kabbalah abreuve sa musique d’autant de tradition que de modernité, d’autant d’Orient que d’Occident. Ces 5 virtuoses réunissent ainsi en un même univers, musique klezmer, hip-hop, chants hassidiques et spoken word. Tickets for this concert available at tickets.com or the 9:30 Club box office. For group tickets & information call (301) 230-2232 or teev.com. Ivri Lider is one of the most popular and respected Israeli singer-songwriters of his generation. His unique voice and versatility have solidified his place as a leading Israeli musician, and in 2005 he received the Best Male Singer and Best Live Show awards at the Israeli Music Awards. Ivri’s music was featured on the soundtracks of the groundbreaking Israeli films The Bubble and Yossi and Jagger. OUT Magazine listed him as one of the “Out 100” of 2007. Presented in partnership with Teev Events, Inc.
For information: 202-777-3251 or wjmf.org. Sisters of Sheynville (Vocal Group of the Year, Canadian Folk Music Awards) will be playing Hugh's Room only a week and a half away, so reserve your tickets now, because this is a show not to miss! Our tasty combination of Yiddish, Swing/Klezmer and even some blues rocked up with jazzy surprises will leave you grooving to the irresistible tunes and rhythms. Adding to our action packed evening of great music and fun we are excited to have George Grosman and the Bohemian Swing opening for us. Together we will definitely transport you to another place and time! So don't waste a minute and hop on the Sheynville Express now! Middle East Peace … Philly Style! featuring international touring ensemble Atzilut and Drexel University’s Mediterranean Ensemble. You are cordially invited to a series of upcoming performances by the Folksbiene Troupe in June 2009. Performances are in Yiddish with English and Russian supertitles. Appearing: Motl Didner, Danielle "Elize" Dorter, Rich "Ruvn" Kass, Daniella Rabbani, Miryem-Khaye Seigel, Zisl-Yeysef Slepovitch. Doors at 8:00 p.m.; Show at 8:30 p.m.
A Céilidh (pronounced kay-lee) is a traditional Gaelic dance party, from the days before discos and nightclubs. But the 2 bands tonight are anything BUT traditional, merging Klezmer, Ska, Celtic music and much more into their own unique, high-energy styles. The Mad Maggies are some crazy musicians from the San Francisco Bay Area who play world-inspired, roots-driven rowdy folk fusion. Tonight’s show follows up on the recent release of their 3rd CD, “Skull and Magpies.” The Mad Maggies are Maggie Martin on vocals and accordion, clarinetist and whistle blower Rhian Robinson, tuba player Johnny Blood, alto saxophonist Adrian Gormley, trombonist Lawrence Jarach, J.X. Lovejones on tenor sax and clarinet, drummer Billy Dee Boom, bassist Lewis Wallace, and guitarist Gary Wium. Fusing bluegrass and American roots music, avant-garde jazz, Jewish klezmer and Hassidic sources, Andy Statman has reached legendary status in the Jewish and non-Jewish music worlds. His virtuosity on the mandolin and clarinet garnered him a Grammy nomination in 2008 for Best Country Music Instrumental. He has collaborated with celebrated artists across the music world, including Itzhak Perlman, Jerry Garcia and Bela Fleck. Andy infuses classic American sounds with spirituality and Jewish mysticism, creating a truly unique experience for audiences of all ages. Accompanied by Larry Eagle on drums and James Whitney on the bass, the Andy Statman Trio puts on a stunning and versatile show. This performance is funded by the Arthur Tracy “The Street Singer” Endowment Fund. Honoring the memory and musical legacy of Arthur Tracy—the renowned radio, stage and screen singer and entertainer whose talent delighted millions around the world—the arts programs supported by this fund continue Tracy’s ability to entertain for years to come. "J. EDGAR KLEZMER: Songs from My Grandmother's FBI Files"
Enjoy a family Friday night with ShirLaLa! Dynamic performer and music educator Shira Kline travels across the country and around the globe sharing her love of Jewish life and prayer with children and families of all ages. Shira’s creative songs delight children, parents and grandparents alike, making Shabbat a fun, interactive experience. Dance, sing and create while sharing these wonderful traditions with your family. 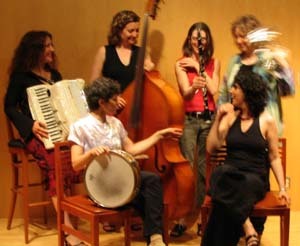 Shira is high energy, high spirited and full of stories and songs guaranteed to warm your heart. After services, enjoy a Kosher, traditional Friday night dinner with kid-friendly foods to satisfy even the pickiest eaters! Irish vocalist Susan McKeown and Lorin Sklamberg, lead singer of the Klezmatics (Grammy winners for their work on the band's Wonder Wheel: Lyricsby Woody Guthrie) will present the Brooklyn debut of songs from their forthcoming World Village/Harmonia Mundi cd Saints and Tzadiks. Note: Sources for the Jewish material were Yiddish Folksongs from the Ruth Rubin Archives (Wayne State Universiy Press, 2007) and Ruth Rubin's field recordings. Spend a raucous and hilarious evening with The Kinsey Sicks, America's Favorite Dragapella Beautyshop Quartet. Combining award-winning a cappella singing, sharp satire and over-the-top drag, this group is must-see entertainment! Lawyers Ben Schatz (“Rachel”) and Irwin Keller (“Winnie”), along with actors Jeff Manabat (“Trixie”) and Spencer Brown (“Trampolina”) have entertained from Las Vegas to New York with shows such as “Oy Vey in a Manger” and “Everything But the Kitsch 'n' Synch,” with material ranging from opera to doo-wop to Yiddish. The Kinsey Sicks have appeared on various television shows including America’s Got Talent. In 2000 the group won the Comedy award at the Contemporary A Cappella Recording Awards. Beginning with Rosh Hashanah and ending on Yom Kippur, this story of a humble Vilna cantor seduced by the fame and fortune of the opera features the voice of Yiddish film star Moishe Oysher, one of the best-known cantors of his day. Carefully lit cinematography, well-shaped dialogue and Alexander Olshanetsky's musical score form a captivating tale of one musician’s redemptive journey. One of the last Yiddish-language films to be made in America, Overture to Glory is based on the play Der Vilner Balebes by Mark Arnstein. "Egg Rolls & Egg Creams" kick-off quickie! Combining rhythmic power and potent folklore, The Sway Machinery’s energy and unique music are unmatched. Jeremiah Lockwood of Balkan Beat Box mixes Cantorial and liturgical traditions with Afro-beats, blues, pop and horns to create a truly original sound. Hebrew, Yiddish and Aramaic lyrics mesh with horns and American blues traditions to create a frenzied, celebratory musical experience. The Sway Machinery boasts a heavy-hitting rotation of musicians including drummers Brian Chase of the Yeah Yeah Yeahs and Stefan Schneider of Montreal-based and internationally renowned instrumental post-rock band Belle Orchestre, bass player Nick Movshon of Antibalas Afrobeat Orchestra, and the trumpet and tenor sax horn section of the band Antibalas, Jordan McLean and Stuart Bogie. The powerful combination of musical personalities yields an unassailable force of excitement. Experience Israeli dance with the most popular instructor in the Greater Washington area! Mona Goldstein has been instructing and choreographing Israeli folk dance for years, and founded the entertainment company Mona Israeli Dance. She currently teaches her popular RikudDC session Sundays at the Washington DCJCC. Mona will have you moving to the energetic beats of classic and contemporary Israeli tunes. Beginners and experienced dancers are welcome. Pitom is guitarist and composer Yoshie Fruchter's musical experiment and exploration into the music that has inspired him. Taking cues from the punk/avante rock aesthetic of the experimental downtown Jewish scene, including John Zorn and Hassidic New Wave, this manic foursome plays wild and frenetic melodies, supported by a mixture of dreamlike tones and driving distortion. Maryland-native Yoshie Fruchter joins Jeremy Brown on violin, Noah Jarrett on bass and Kevin Zubek on drums to produce the next step in Jewish sound. Pitom’s first CD, released on John Zorn’s Tzadik Records, was noted as one of the best debut albums of the year by The Wall Street Journal. Composer Daniel David Feinsmith constructs his original classical compositions using the gematria (numerology) of Jewish holy texts, including the Tanakh and ancient Kabbalistic writings, turning the written word into beautiful and astonishing arrangements. The music crosses the boundaries of tradition, evoking the exhilaration of mystical Judaism and interpreting the words of Torah anew. Each member of Feinsmith Quartet—cellist Jennifer Culp, bassist Michael Manring, classical guitarist Gyan Riley and pianist Christopher Taylor—has received critical acclaim for their unique talents. for more ticket information, and for a lower service charge, visit: and log in with username="jdub" and password="tickets"
The Yiddish Artists and Friends Actors' Club in conjunction with the New Yiddish Rep and the Congress for Jewish Culture invites you to a very special evening as we close our 2008-2009 season. It will take place on Wednesday, June 10, 2009 at 6:30 PM at our headquarters in the historic Hebrew Actors' Union building, 31 East 7th Street in Manhattan. With a special L'Khayim in honor of actress Mina Bern's birthday! A glatt kosher chicken dinner will be served. Please reply to Ruth Harris at 516-569-1678 to make your reservation no later than June 1, 2009. A rare chance to see and hear the band in NYC club atmosphere. Electro Morocco is a unique mixture of intricate electro beats and Middle Eastern flavor, with a retro rock and pop edge. Thriving from the pulse of music born in the Middle East, their sound rises, swells and cuts to the core with a dense recipe of swirling otherworldly sound, the powerful persistence of electro-rock rhythm and stiletto-sharp guitar lines. Electro Morocco delivers soul-stomping performances all synced to self-produced video clips. Seasoned musicians Assaf Spector, Roy Gurel, Shlomie Lavie, Taylor Galassi and Yula Beeri mix everything from retro rock to Middle Eastern folk music, to warped electro in a fierce, high-energy performance. DJ Balagan a.k.a. Sam Hopkins, has been producing his own sample-based dance tracks since 2003, incorporating Sephardic elements among various other ethnic styles. Miri Ben-Ari, a Grammy award-winning violinist from Israel, has created her own unique sound by a revolutionary fusion of classical style with jazz, R&B and hip hop. She has been recognized as a musical pioneer. This classically trained musician has helped sell millions of records by collaborating with other Grammy award-winning artists such as Kanye West, Jay Z, Wyclef Jean, Alicia Keys, Wynton Marsalis, Britney Spears, Maroon 5, Donna Summer, Janet Jackson and John Legend among others. She studied under the late classical master Isaac Stern and has earned the honor from New York's Apollo Theater as an “Apollo Legend.” She is known as “The Hip Hop Violinist,” the title of her latest album on Universal Records. 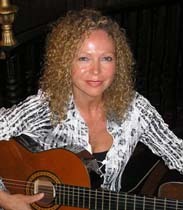 Miri Ben-Ari was honored as one of Jewish Women International's "Women To Watch" in 2007. She received the 2008 Israel Film Festival Visionary Award, and she is the first Israeli to receive the Martin Luther King Award from Israeli President, Shimon Peres. Miri Ben-Ari is the CEO and co-founder of Gedenk ("Remember"), a non-profit organization dedicated to promoting awareness among young people about the Holocaust. "The time of singing is come"
The activities will start with a Sephardic songs children workshop (ages 9+) , then we will have some amazing snacks for you to try and the evening will finish with a concert of beautiful songs Monica will be performing with the great Steve Homes on the guitar, Ilana Cravitz on the violin and Ulises Diaz on the percussion. Hilary Pomeroy Sephardic music and culture expert will introduce some of the songs. We are really happy we can count with her experience and knowledge to guide our audience through the wonderful world of Sephardic culture. It will be a great evening. with their show: "Our Zeydas and Bubbas as Children"
a revue about kids, young and older, and their relationships with each other, with their parents, and with the world around them. The songs are all in Yiddish. Sunday, June 14th, 2009, 7:00 P.M.
From Paris France, Warsaw Poland, Houston Texas, Los-Angeles, to Montreal and New York, In an all too rare appearance Tova and MATT reunite for one night only in Toronto. "Planet Jazz describes Theresa Tova as a "Towering, pan-cultural jazz-cabaret diva ". "A classy, jazzy and deliciously sensuous performer” TOVA has gone from the Broadway musical stage to Concert and Jazz venues around the world. “She sings with every part of her being. From her gaze to her hands to her little finger she fills you up and draws you in”. "A poet at the keyboard, ...a smoldering inner fire impels Matt Herskowitz to flout musical convention, creating a jazz that's as enthusiastic as it is inventive. and "A complete pianist with irreproachable technique, MATT HERSKOWITZ offers such an astonishing reading of repertoire that one forgets that he's playing alone, without orchestra." June's "Duo Brikcius - 2 Cellos Tour" concerts of two Czech cellists (and siblings) Anna Brikciusova and Frantisek Brikcius will take a place in Frydlant (54th Dvorak's Festival), in Turnov (newly reopen Synagogue Turnov) and in Prague (Jewish Museum). In addition to Fantasie IV (2008) by the Czech composer and organist Irena Kosikova, Duo Brikcius will feature Duo for Violin and Cello (1939 40) by the Jewish - Terezin composer Gideon Klein, as arranged for two cellos. Held under the auspices of the Prague City councillor for culture and heritage and the Italian Culture Institute in Prague. Concerts will feature music by L. Boccherini, W. A. Mozart, G. Rossini, P. Hindemitha, G. Klein and I. Kosikova as well. “Theodore Bikel: The First 85 Years” – Broadway a legend Theodore Bikel, a lifelong social justice advocate, will celebrate a rich career devoted to art and activism with a star-studded 85th birthday benefit concert at Carnegie Hall. All proceeds will go to the Juvenile Law Center. Confirmed performers to-date include: Theodore Bikel, Alan Alda, Arlo Guthrie, Rosemary Harris, David Amram, Beyond the Pale, Artie Butler, Patricia Conolly, Judy Kaye, David Krakauer, Tom Paxton, Serendipity 4 (Shura Lipovsky, Merima Kljuco, Tamara Brooks, and Theodore Bikel), Noel Paul Stookey and Peter Yarrow, Susan Werner, Michael Wex. 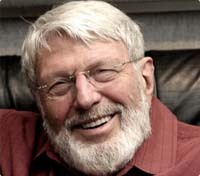 New York (April 16th) – Broadway and folk legend Theodore Bikel, a lifelong social justice advocate, will celebrate a rich career devoted to art and activism with a star-studded 85th birthday benefit concert at Carnegie Hall on Monday, June 15, 2009. The concert will benefit Juvenile Law Center (www.jlc.org), the pioneering, non-profit law firm dedicated to protecting the rights and well-being of children in the child welfare and juvenile justice systems. Bikel will be joined by Alan Alda, Arlo Guthrie, Rosemary Harris, David Amram, Beyond the Pale, Artie Butler, Patricia Conolly, Judy Kaye, David Krakauer, Tom Paxton, Serendipity 4 (Shura Lipovsky, Merima Kljuco, Tamara Brooks, and Theodore Bikel), Noel Paul Stookey and Peter Yarrow, Susan Werner, and Michael Wex. Honorary committee co-chairs for the event include Barbara Cook, Frank Langella, Pete Seeger, John C. Whitehead, and Elie Wiesel. Bikel made his Carnegie Hall debut in 1956 and went on to forge an extraordinary career as a musician, actor and activist. His stage and screen credits include such classic films as The African Queen and The Defiant Ones and the 1959 Broadway premiere of The Sound of Music, in which he originated the role of Captain Von Trapp. He has performed the role of Tevye in Fiddler on the Roof more than 2,000 times and is currently starring in a national tour of Sholom Aleichem: Laughter through Tears. A leading light in the folk-music scene of the 1960s, Bikel was a co-founder of the Newport Folk Festival and has been a powerful advocate for peace, human rights, and social justice for more than five decades – from the civil rights movements in the United States to apartheid in South Africa to promoting peace and religious pluralism among Israel and its neighbors. All proceeds from the concert will go to Juvenile Law Center, which works to protect children’s rights and interests in the child welfare and juvenile justice systems. Juvenile Law Center, which provides legal services at no cost to its clients, is currently heading litigation in the Luzerne County, Pennsylvania judges scandal, a court corruption case that has made international news as one of the most egregious violations of children's rights in U.S. legal history. The organization’s work on the case was recently covered by 20/20 (http://abcnews.go.com/Video/playerIndex?id=7194700), the New York Times (http://www.nytimes.com/2009/03/28/us/28judges.html?_r=2), and People magazine. Tickets go on sale April 16th and range from $30 to $500. A pre concert VIP reception for performers to mingle with sponsors, major donors, and box seat ticket holders will be held in the Rohatyn Room at Carnegie Hall. Founded in 1975, Juvenile Law Center is the oldest multi-issue public interest law firm for children in the United States. With an approach grounded in principles of adolescent development, Juvenile Law Center uses the law on behalf of youth in the child welfare and criminal and juvenile justice systems to promote fairness, prevent harm, ensure access to appropriate services and create opportunities. Juvenile Law Center uses an array of legal and other advocacy strategies to ensure that the child welfare, juvenile justice, and other public systems provide vulnerable children with the protection and services they need to become healthy and productive adults. In 2008, Juvenile Law Center was one of eight organizations around the world to receive the prestigious John D. and Catherine T. MacArthur Foundation Award for Creative and Effective Institutions. "Emerging Writer" award to Harry Bernstein. A new line-up of the best local Jewish talent will be showcased followed by an after-party on the terrace overlooking New York Harbor. Every Sunday Morning, combining live music and food in a fresh, cultural environment, City Winery’s Klezmer brunch series pairs some of the greatest musicians in the world with delicious lox, bagels and other tasty fare on Sunday mornings from 11am to 2pm. City Winery's brunch on May 31, 2009 features the Michael Wingrad "Hot 7" Klezmer Ensemble, woohoo! In an unusual visit outside of Israel, the 13-member string orchestra of Arad arrives at Temple Reyim, Newton, for one concert, Wed. evening, June 17. 7:30 pm. Long considered by many to be one of the best in Israel, the orchestra is performing its first concert outside of Israel since 2006, when it toured Canada. Consisting of young talented musicians, the orchestra plays classical and modern pieces, including pieces by Israeli composers. Some pieces feature vocals in Hebrew, Yiddish, or English. Much of its repertoire is played by the finest orchestras all over the world. The orchestra comes from Arad, Israel, a small town that lies at the border of the Negev and Judean deserts, between Beersheva and the Dead Sea. The modern town sits near the site of Tel Arad, an ancient city of the same name. While visiting Newton, the orchestra will be hosted for two nights in the homes of Temple Reyim members. Visit the Arts Council's website for ticketing information or call 609-924-8777. Critically-acclaimed and award-winning, Toronto’s Beyond the Pale is one of the most exciting ensembles in the Canadian folk, roots, and world music scenes. Their explosive acoustic sound is inspired by a wide range of cross-cultural influences, from European folk styles (Klezmer, Balkan, Gypsy, Romanian) to contemporary and North American styles (bluegrass, jazz, reggae, funk, and more). They are known for their instrumental virtuosity, infectious energy, and unique repertoire featuring both original compositions and inventive arrangements of traditional material. With spectacularly dynamic and exuberant live performances, Beyond the Pale’s unique genre-defying sound has delighted audiences of all kinds at major music festivals, concert theatres, and clubs across Canada and the US. Beyond the Pale's most recent CD release "Consensus", an exciting and wideranging live set of all-new material, has met wide critical acclaim and received honours from the 2005 Canadian Folk Music Awards, 2005 Toronto Independent Music Awards, and Ontario Council of Folk Festivals 2005 songwriting Competition. Their debut CD "Routes" also received rave reviews from across the globe and was nominated "Best World Music Album" at the 2002 Canadian Independent Music Awards. Their recordings are heard regularly on folk and world music radio across North America and they have been featured in a number of national live concert broadcasts on CBC Radio. The group is now beginning work on their third CD, to be released fall 2006. SPIRIT OF JAZZ organise la venue en juin, pour la première fois à Paris, des deux fondateurs du collectif Afro-Semitic Experience : le contrebassiste David Chevan et le pianiste Warren Byrd. Mélange de rythmes afro-américains et de mélodies hébraïques, la musique de David Chevan et Warren Byrd est l’aboutissement d’une histoire culturelle propre aux Etats-Unis. Quand le jazz rejoint la synagogue, cela donne un groupe chatoyant, riche et complexe qui illustre un dialogue et un vécu spécifiquement américains. A leur culture et leur pratique de musiciens de jazz se superpose un projet original, qui sait générer la méditation comme l'enthousiasme tout en évoquant les destins croisés des communautés américaines noire et juive américaines. Dans cette dynamique culturelle du prolongement et de la transmission, Warren Byrd et David Chevan construisent aussi un discours social qui affirme l’actualité d’une écoute entre les communautés, voire d’une synthèse qui aménage un espace commun tout en conservant les particularités de chacun. 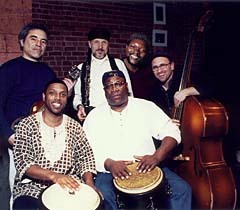 The Afro-Semitic Experience, créé en 1997, est un superbe et audacieux mélange de tradition juive et de bebop, de gospel et de musique synagogale. 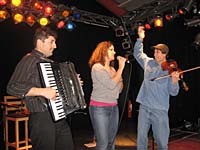 June 20, 7:30pm: The Klosterscheune in Zehdenick (outside of Berlin) Yale Strom, Peter Stan & Elizabeth Schwartz of Hot Pstromi in concert with new and traditional klezmer and Yiddish music. A multi-media Cuban-Jewish blowout bash!! Featuring music with Sexteto Rodriguez & Sarah Aroeste, salsa dancing w/ famed Franck Muhel, art exhibit of acclaimed Cuban painter Javier Gonzalez Gallosa, documentary film clips and more! from 13h till the evening concerts, free entrance. June 23, 7pm: Yale Strom, Elizabeth Schwartz & Peter Stan of Hot Pstromi return to Strasbourg, France for a concert of new and traditional klezmer and Yiddish music at the JCC. 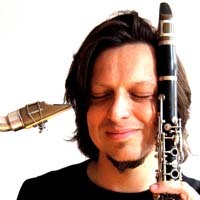 Winners of the 2007 Jewish Chronicle's Klezmer Idol, Stewart Curtis' K-Groove brings us an evening of jazz and Klezmer with Latin undertones. The band features Stewart Curtis - saxes, clarinet, flute, piccolo; Paul Jayasinha - trumpet, flugelhorn and percussion; Rob Terry - keyboard; Brad Lang - bass; Hans Ferrao - drums. Stewart and the band have worked with a variety of stars including Nina Simone, Whitney Houston and Michael Ball. K-Groove is firmly established as one of the UKâ€™s finest and most infectious Klezmer crossover bands. June 25, 7:30pm: Yale Strom, Elizabeth Schwartz & Peter Stan of Hot Pstromi will perform at the Israelitische Cultusgemeinde Zurich in Zurich, Switzerland following a screening of Strom's documentary film, "A Great Day on Eldridge Street". For more info. contact www.icz.org. on Eldridge Street" will be followed by a klezmer concert with Yale Strom, Elizabeth Schwartz & Peter Stan of Hot Pstromi presenting new and traditional klezmer and Yiddish music in Alsfeld, Germany. on Eldridge Street" will be followed by a klezmer concert with Yale Strom, Elizabeth Schwartz & Peter Stan of Hot Pstromi returning to the KFZ Klub in Marburg, Germany. Join us Sunday June 28th for a dance lesson with Klezmer dance maven Bruce Bierman, 7:00-8:00pm. Live klezmer music and dance party, 8:00-9:30pm, with the acclaimed Heather Klein's Inextinguishable Trio!. Alla Gladysheva on piano and Jonathan Russell on clarinet.with special guest: David Rosenfeld of Kugelplex. $10-$20 adults (sliding scale), $5 kids. Come to dance or just to watch and listen. Bring your friends, too. For more information call 510/848-0237. Co-sponsored by the Jewish Music Festival and Lehrhaus Judaica. from "Porgy and Bess" sung by the Ebony Chorale of the Palm Beaches, plus Copland's "Fanfare for the Common Man" and "A Lincoln Portrait." This is the "not to miss" concert of the summer. The concert is sponsored by FAU Libraries, with additional support from WXEL and FAU's Student Union.